Since there were some questions asked by readers of the previous post I will try to answer those. Pressing tools like hams, clappers, steam rolls can be ordered from suppliers of tailoring tools like wardrobesupplies or greenburg-hammer in the USA. To my knowledge this rectangle one is a Dutch design, made for a tailoring course at a fashion school, I never saw this rectangle shape outside The Netherlands. And I was lucky to find one at a Dutch Auction site. If you are interested in buying one, let me know and I can look around to see if I can find another one. Press bucks and tailoring hams are used by tailors and dressmakers and are available in different shapes and have different pressing features, like you can see from these German tailor suppliers, the press bucks from schlemming.de are velvet covered . Like this one. 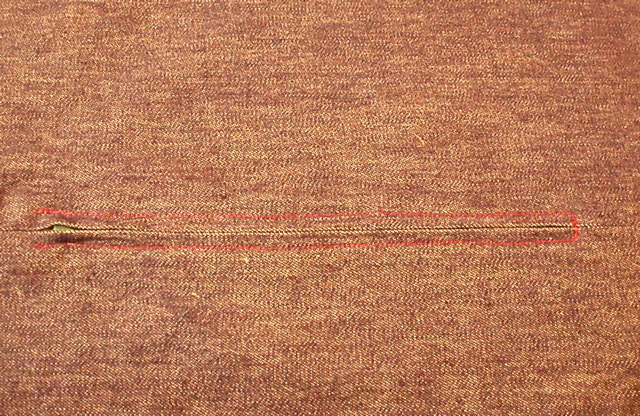 The bucks from k-m-versand are covered with linen. I could not find any information about ordering from outside Germany, but it will give you an idea what kind of bucks are used in tailoring and dressmaking. Pressing techniques can be found in a lot of vintage tailoring/ dressmaking books . Like anyone who sews, we all know the important part of sewing is pressing. It starts with preshrinking the fabric prior to cutting the fabric, but also the pressing which takes place in the process of sewing the garment. My pressing equipment: a vacuum suction pressing board , steam iron with a 3,5 liter water tank, the sleeve board is turned under the board .My pressing board is 116 cm long ( 45 inch) and 38 cm wide ( 15 inch) The pedal on the ground is used for the suction function.My press iron has a Teflon cover. You can see the sleeve board ready to use. Besides the use of the oval shaped edge of the pressing and sleeve board, I use several pressing tools, like this large tailor’s ham for any contoured shapes or curves like princes seams in jackets, coats and dresses. This small one , which I covered on one side with a piece of wool crepe fabric I use for bust and waist darts and collars, sleeve cap easing etc. I have a June Tailor hamholder but I hardly use it, maybe because it does not fit my small tailor’s ham very well. Probably the size of the US tailor’s hams are different than my Dutch one. You can see the difference of the two hams in size now they are on top of each-other. A press buck ( in Dutch called pers bok) which has a different shape, straight lines and curved corners. The buck has a wooden base and legs, the size of the rectangle is 31 cm ( 12,5 inch) wide 22 cm ( 8,5 inch) the padding is 5 cm thick ( 2 inch) The total height is 23 cm ( 9 inch) which is lower than the all known oval shaped ham. The advantage of this press buck is the different shape and size above the other 2 hams.Use for pressing seams open like shoulders, bust area, neckline, collars and darts . I bought this buck last year for only € 16.00 it is a used one but still in a very good condition. New ones costs about € 50.00. Tailor hams are expensive but will last a lifetime. Point presser/clapper is a great tool to press seams open and to beat the steam into the fabric to flatten bulky edges. Point turner to press open for the hard to reach seams where the point presser is of no help. But also a wooden spoon is a great tool, even a wooden chopstick can be helpful. I inherited this press block from my grandfather who was a tailor but I only show you this because it is old one (about 80 years) and not very smooth anymore , but I keep this for sentimental value. I asked a timber to make me some new press blocks from steamed beech wood because the advantage of steamed beech wood is, it will not bend out of shape . The large block is great for pressing seams open like pants or any long seams, and I use those blocks to flatten seams while cooling down. You can see a detailed picture of the shape of these blocks here, the small one is a rectangle while the large one is a curved one. They can also be used by pressing the seams open or to flatten the edges from a jacket or coat while the fabric is cooling down. The seam roll is made from a Saturday newspaper tightly rolled and covered with 2 layers of fabric, the first one is cotton the second layer of wool fabric . The handle of a shoe-brush made of unvarnished wood is also helpful as a pressing block and the brush side I use for removing threads or brush fabric. For sleeves I use the sleeve board but sometimes the arm roll gets some use too, this one is made to use with a dress form but I like to use it as a seam roll for a 2 piece sleeve. Here you can see the upper side. The underside of the arm. As well as fine linen cloths. 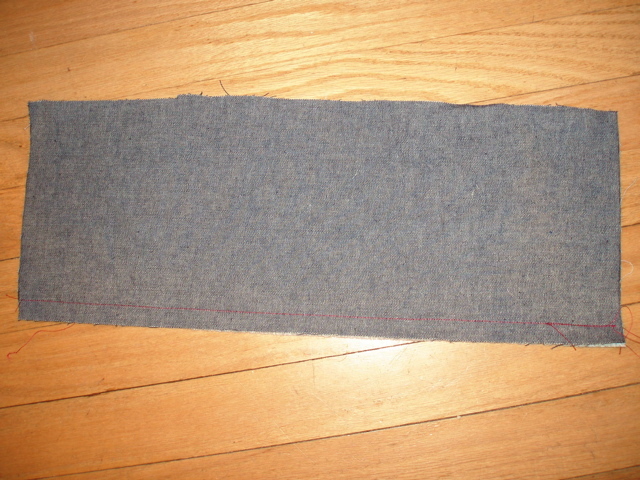 I made a sort of mitt from 4 layers of heavy Terry which can be helpful if I need to press any small curved seam. Templar sheets used for appliques are a great tool to prevent pressing imprints. 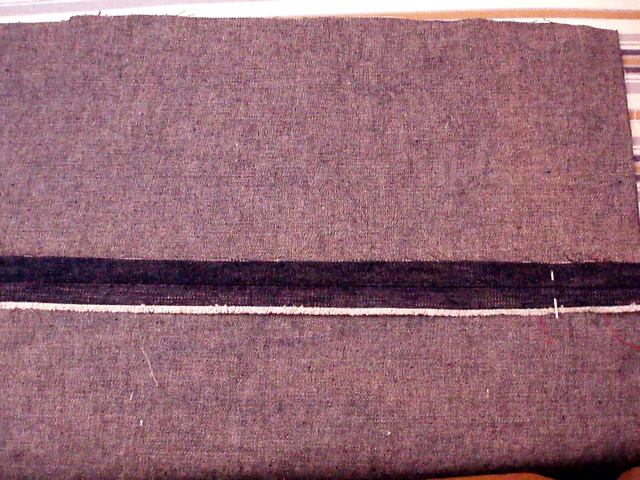 I cut the desired shape for example if I need to press a bound buttonhole. 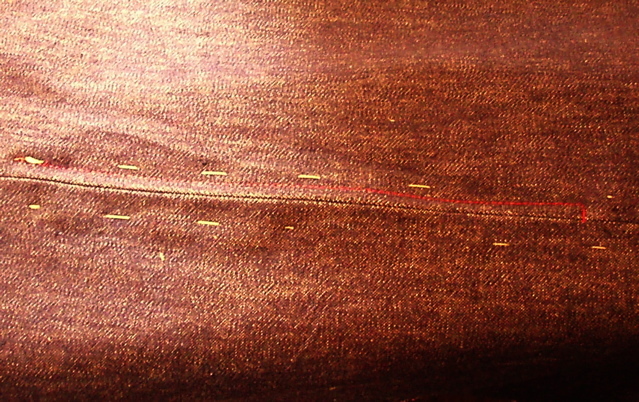 Pressing a bound buttonhole form the inside , you can see the Templar sheet is placed around the bound buttonhole edges. Because you can cut the desired shape I use those sheets too for pressing mitered corners on a skirt or jacket hem. To seal, seam seal tape for covering the seams in rain coats. Another tool which I inherited from my grandfather was a wooden hat shaping block, and I found it very useful to use as a pressing aid when I made a hat and needed to press the seams open. Here you can see the hat block closed. The Sewing Divas is a beSewStylish.com BFF! This is rather fun. I was perusing Taunton Press’ new beSewStylish website, and in their blogroll of Favorites, what should be there but The Sewing Divas! That’s nice recognition, and unsolicited, which makes it even nicer. Three of us (Georgene, Gigi, and Gorgeous Things) are occasional contributors to Threads, but none of us had any idea that this blog was going to be listed. If you are a new sewist, I highly recommend beSewStylish and the companion publication, SewStylish. They have lots of tips in one place, and are laid out in an easy-to-read format. Can Internet Swatching be Far Behind? Alright! For those of you who have avoided shopping for fabrics on the internet, this may provide you the opportunity you have been waiting for. While the practical uses in the near term will probably be limited to communications between manufacturers and designers situated in Europe and the Americas, and their textile mills in the Far East. Imagine the possibilities for the home marketplace down the line. Who knows, some day you may be able to rub your hands along different silk crepes or woolen boucles. How fun would it be to ‘handle’ Linton Tweeds from the comfort of your own home? Sewing Diva Heaven. I was working on my bias shirt today, installing the zipper in the back. It’s a centered application, which I actually like, but it can have disastrous results if not done properly. So I thought, “Hmmm, maybe there’s a tutorial here that might help some folks. So here you go. This way works for me; hopefully it can help you too. 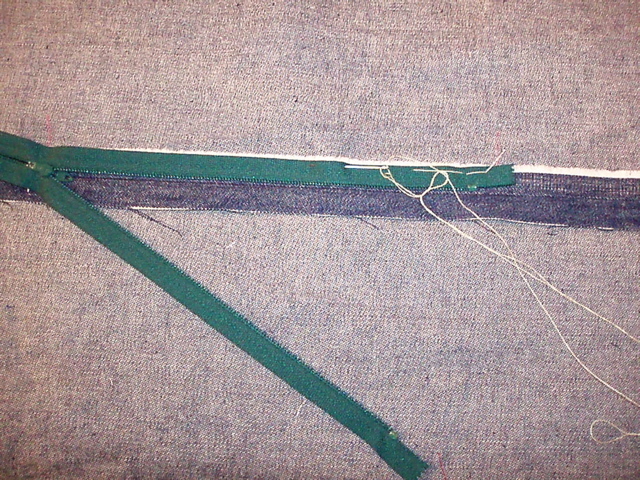 Baste the remainder of the seam closed, and press the seam allowances open. This is probably the most critical part of the whole operation. In most commercial patterns, the instructions tell you to machine baste the zipper in place, then sew in place. The problem is that with most fabrics, machine basting will cause slippage, and then when you sew the zipper, you will get bubbles and puckers, the hallmarks of “Happy Hands at Home” syndrome. Notice something in the picture. The zipper teeth are set very slightly back from the basted seam, probably a scant 1/16th of an inch. This will keep you from getting “zipper gaposis”. Next, close the zipper and baste the other side. Here again, you will want to pull the zipper toward the raw edge of the seam as you baste so that, when opened, the teeth are ever so slightly offset from the folded over seam allowance to keep the gaposis at bay. 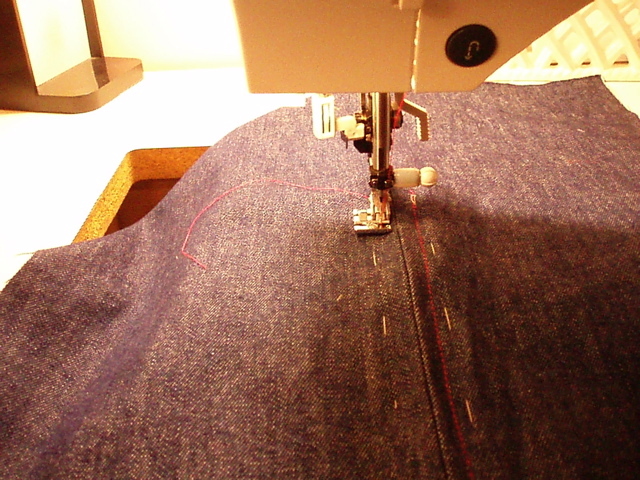 Once you have your zipper basted in place, sew down one side of it using your zipper foot on your sewing machine. There is only one tricky part to this operation. To keep from getting a stitch “bubble” around the zipper pull, open the zipper before starting sewing. Once you get about half way down the zipper, drop the needle into the fabric, lift the presser foot, and carefully close the zipper (you’ll be working from the underside of the fabric). 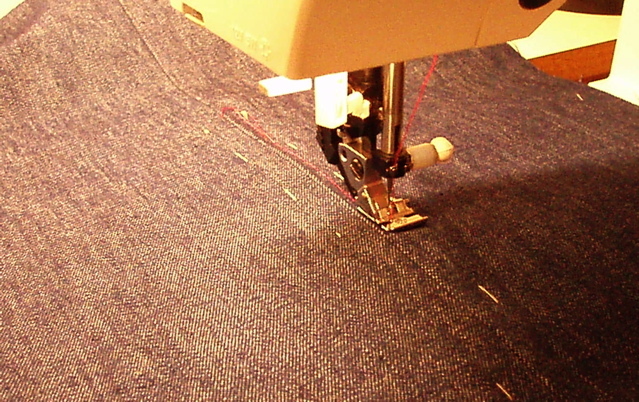 Once the zipper is closed, lower the presser foot and continue sewing. 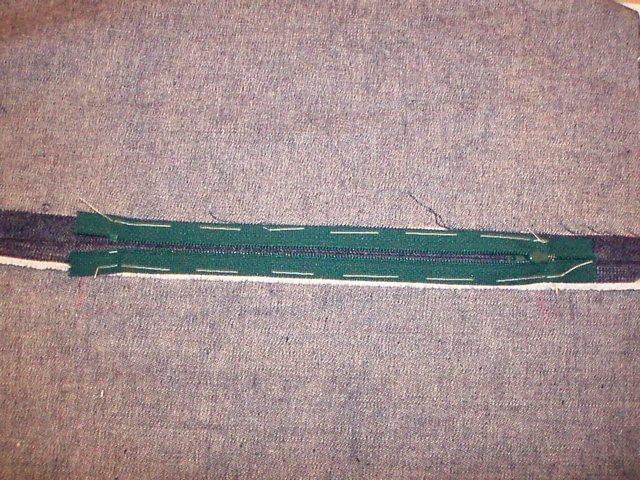 Pivot at the bottom of the zipper, and sew to, but not all the way across, the zipper, avoiding the metal zipper stop. Repeat this step on the other side. Here’s the other important part: To avoid needless bubbles and distortion, start at the same place, but on the other side of the zipper, so you sew both sides in the same direction. Once you have the zipper sewn in place, remove all the basting and press carefully. Voila – a perfectly placed zipper with no bubbles!